DAYTONA BEACH, Fla. (Sept. 19, 2017) – American Flat Track is pleased to announce its return to Daytona International Speedway’s legendary tri-oval for the second annual DAYTONA TT on Thursday, March 15, 2018. Following the sport’s hugely successful debut event inside the world’s only motorsports stadium this past March, American Flat Track will be back under the lights in 2018. 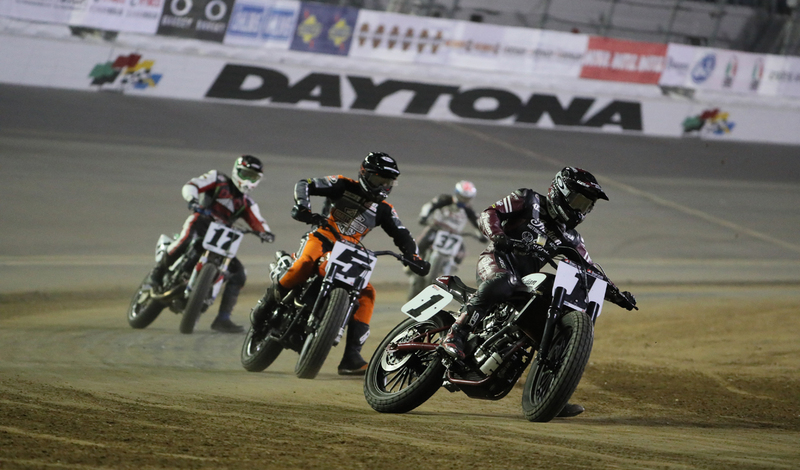 Fans attending Bike Week At DAYTONA festivities can look forward to another action-packed evening as the top dirt track motorcycle racers in the world battle on a custom track built directly in front of the stadium’s ”World Center of Racing” tower. To kick the action up a notch in 2018, the race circuit will be re-engineered to feature a bigger, better, and faster track design. The 2018 running of the DAYTONA TT will serve as the launch point for American Flat Track’s coast-to-coast calendar, setting the stage for what’s destined to be another epic season in a sport where high-speed battles and victory margins measured by fractions of a second are the rule rather than the exception. Tickets for the 2018 running of the DAYTONA TT will go on sale on Monday, Sept. 25 at 10 a.m.